The two produced 33 dolls for the art exhibition titled "Barbie: The Plastic Religion" set to open in Buenos Aires this October. Marianela and Pool came up with the decision not to feature the controversial dolls anymore amid massive online protests by Catholics and Marian devotees in Argentina, France, and other parts of the world. With deep regret and with immense helplessness that surrounds us, we report that we have decided to withdraw from the exhibition 33 pieces (sculptures made with Barbie dolls) that are part of the exhibition "Barbie: ThePlasticReligion". We have taken this action because we believe that the meaning of the work has been misinterpreted and especially distorted. From our vision and as artists, we never wanted to hurt feelings of people of faith, regardless of the religion they profess. From this statement, we would like to explain the purpose and without intermediaries, the purpose of the sample as in our case, the moves of the press, audiovisual editions of the opinions we have turned to the media and malicious words of some communicators, altered and confused the message. As the first point, we contextualize the work. It was conceived in this particular country is Argentina. We who live here know and experience the melting pot of races and religions living together in harmony. As individuals and artists we are, we are guided by the concept of otherness, where we recognize the differences with another and respect, seeking common-union with them. Another item to clarify is the decision that Barbie dolls are figures of representations. We feel that this, perhaps, is what has offended some people. However, our justification has meaning. We know, because we have studied and analyzed the artistic-religious history, which always Christian figures have been adjusted to the model of beauty for each era. For example, in the era of robust women they have been represented in such manner, at times entailed styling that particular way. At present, the Barbie doll represents the canon of female beauty. We can agree or not with it (in fact, we do not we), but we can not do is fail to recognize this situation that many Argentine and Latin American women, trying to reach a stereotype of the "perfect femme" live required by the society in which we live. In the place where we reside, the discrimination against women, and in many cases the man is not racial or ethnic, but from the aesthetic beauty and impositions. This message is built on respect and attachment of the differences, as we participate fervently against racism and hatred. The first pieces we created were those representations denuestra religion. Both are Roman Catholic Apostolic and also revere pagan saints, known colloquially popular, which felt devotion. Because quecontamos happily with a lot of friends who have different beliefs and faiths, many have been amazed at what they could see of the work and asked us to include figures of their religion within the sample. In this regard, we have found friends in the religion that identifies Hinduismola. That was the reason we have included Kali, because we were amazed and engrossed with explanations, feelings and words of these comrades, who visit us in our home and introduced us from faith in the belief hinduista.También, we receive the order Buddhist friends, Yoruba (religion of which we have only received praise), Jews and Muslims (the latter were those who were taught about their religion and explained that the best way to honor them was not to represent the prophets of Islam). With this, we want to make clear that our decision to include the display various religions was analyzed and extremely studied. We did it in good faith concienciay. Besides talking with our friends, we have traveled the "Quarter Once" (Argentine multicultural epicenter located in Capital Federal in the country) and different "Santeria" in the city of Rosario (place where we live), where we observed that todaslas religions religious representations of sale and the same figures that we have prepared for the work sold. However, these silhouettes are sitiosjamás Islam. This reassures us that the Muslim prophets should not be represented, as they are not marketed as religious figures. This seems the most appropriate way to follow including, but at the same time, to respect the decisions of non-production of religious figures of the Muslim people. We have also not seen marketing figures of God, in its various forms, and so we have not respected the inclusion in the sample. Thus the Christian peoples, Hindus, Buddhists, and pagans Yoruba represent their deities in figures and can be purchased at stores in our country. There are different types. In this sense, there are the beautiful and lavishly produced, reaching a high economic price. However, lower cost are made in plaster, with a faithful reproduction with little imperfections in your paint, designed for mass production which, in our opinion, ends up looking disrespectful and sometimes inaccurate aesthetically. On the contrary, we have made every figure with a high level of detail and considered making, seeking to bring the piece to a degree of perfection máximadesde reach, because it is required and defines our commitment as artists. We, who can recognize in these words, that if we had wanted to hurt or cause, the resources that would have used would have been different: aggressive, inappropriate, disruptive, different in short, in order to attract attention from elsewhere. But it is not the intention that guides our work. It is not the belief that we maintain. There are feelings that we have. Everything is designed so that each figure represents with fidelity to the original. We wanted to make clear it. I honestly do not understand why we were attacked from a position of hate and misunderstanding. It is really painful that many are expressed, from misunderstanding and malice on our work that was conceived from a pure and benevolent way. The Holy Catholic Headquarters is included in those that do not quite envision the entire project, you are left with part of an idea and not try to perceive what lies beyond the novelty of difference that exist in our work. We ask ourselves, maybe the world is no longer quite disturbed, full of hatred, to continue to generate more debate on religious differences, cultural beliefs and representations? Perhaps ... it is not from the differences we meet? It is difficult to apologize when our goal was never hurt, but on the contrary, seek to build a message of unity and love of / for religions, framed in the existing social-cultural context. However, to have received messages from discomfort and pain in the work, with heartfelt words from good terms and we know that you need to apply to forgive us and explain the meaning of our work and our sensibilities as artists. We extend this apology to all those who were injured in their faith and yet have remained silent, respecting. However, we feel a deep pain and distress to the attacks that we have made and the threats that had been delivered to us. A strength of this, we decided that the parts not be displayed making as well, with the task of those who stopped to never listen or analyze, or even try to think on our passion as artists, our devotion and respect for religions and art that do. This decision is difficult for us, is not to increase the hatred, nor give tools to those who want to destroy. It's sad and frustrating for us, we feel the artistic expression as a definition of life, having to suppress what motivates us. This is not the first time it happens. There are precedents in argentine art of destruction and aggression in disputed or not understood by society samples. Not risk or allow something that we have created with so much love, work, dedication and effort in danger of being destroyed. We know that many will be happy. But we also know that there will be those others, who like us, feel the art from the depths of himself and will be disappointed as they have supported and praised our work. They ask you to please know understand why this decision and we extend our apologies. We also believe that we have to apologize to the AFT Gallery, who are hurt by this measure. We would add that we have taken this decision because we believe deeply in the artist's responsibility. A person who is dedicated to art, as we do, must be consistent with the message that seeks to reach everyone. Continue with this would keep glued to a feeling of hatred that makes us feel bad and unable to generate. Prioritize love, before our vocation. Because every vocation must be based on love, feeling that guides and determines us. We are unable to carry out works where religions and beliefs are affected. We would not allow our ideology. 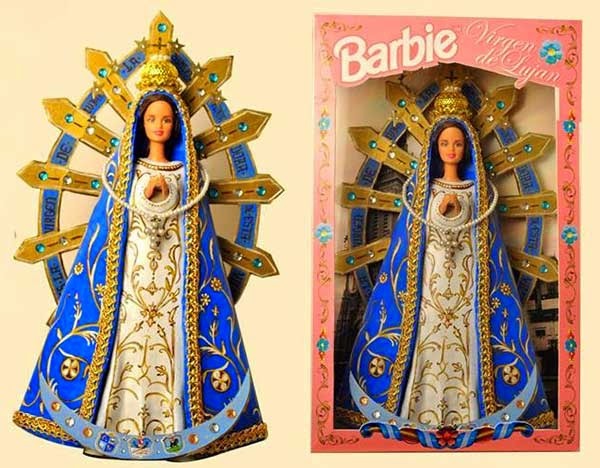 "Barbi: ThePlasticReligion" would be part of the overall exhibition entitled "Saints and Sinners". For all that we've been through, the magnification has been given to this news, for misinterpretations of various types on the meaning of the work and on those who believe that we are as artists, by the incoherence of many pundits-communicators by unfounded attacks and cowardly threats, lack of understanding and listening to those who profess religious devotion, lack of commitment and respect for differences, it has become apparent that we live immersed in a world so full of hatred can not yet recognize love. We feel that, once again, who is bleeding ... is art. Besides asking for apology and saying they felt disrespected, the Argentinian artists also revealed that they will refrain from using social media for a couple of days.